The Russia World Cup 2018 kicks off on January 14, in total 32 teams qualified to take part on the most important soccer tournament in the world. This is the 21st edition of the FIFA World Cup and will carry on through July 15. Out of the 32 participating teams, 30 have previous World Cup experience, while Iceland and Panama are both making their first appearances in the FIFA World Cup. 64 matches to bet on, and many, many props. Are you keeping track of all the chances you have to make extra money? 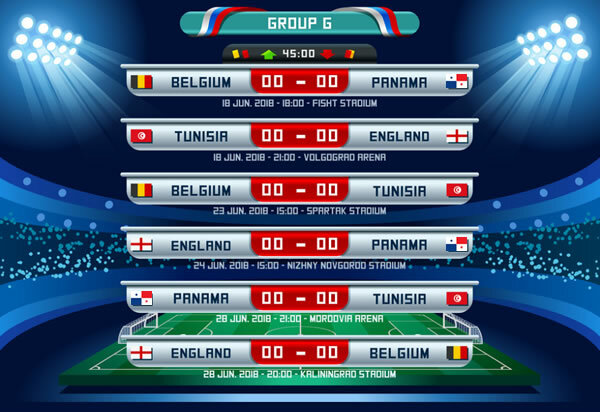 To make this task easier we offer you a brief analysis of Group G of the Russia World Cup, a group formed by Belgium, Panama, Tunisia, and England. The best ranked and strongest in this group, Belgium had a great performance during the qualification phase. Panama and Tunisia should not present any problems for Belgium, leaving England to create some competition. Belgium has plenty of experience in World Cups having participated in 12 editions. The English team is solid, it has great players and they play a dynamic game. An effective defensive line and a balanced team that combines youth with experience, England has been playing very well and will surely put on quite the game against Belgium. Getting past Panama and Tunisia should not present a problem for England. This is the first World Cup for the Central American team, an although they lack experience and their team still presents several deficiencies, the Panamanians are motivated and have nothing to lose, this means they will give a good effort. Odds are certainly against them, but being underestimated might just be their best weapon. The team ranks 21 in FIFA, which is not bad; yet, they are inconsistent, playing above average matches sometimes and poorly other times. They’ve never made it past the group stage, and it is unlikely they will do so this time around with contenders like England and Belgium. The match everyone wants to see is Belgium vs. England of course, but it’s not easy to predict the result. If the line is right England might be a good pick for this game. The World Cup is considered the biggest gambling event; bettors all over the world will be turning to their bookies for action; if you are a bookie, make sure you are ready to take action, if you need help, turn to an expert pay per head service such as AcePerHead.com; take advantage of this event that happens every four years and make the best of it, grow your business and simplify your operation. With Ace per Head, you’ll be able to offer your clients a huge variety of lines and props to bet on.